Movie Review: After an extraordinary start, marked by unforgettable presences in “Dead Man”, “Ed Wood”, “Gilbert Grape” and “Donnie Brasco”, the actor Johnny Depp has fed his curriculum, not only with dignified choices based on fantasy - most of them conceived by Tim Burton - but also with a few repulsive flicks like “The Lone Ranger”, “The Tourist”, and “Transcendence”. 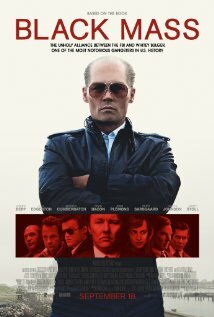 In the fact-based “Black Mass”, a fairly watchable gangster thriller, directed by Scott Cooper in a similar line of Scorsese, he returns to a strong role, playing the violent Irish-American gangster, Jimmy ‘Whitey’ Bulger, who was a terror to his enemies, but a sweet, nice guy for his family and friends. The film starts with Johnny Martorano (W. Earl Brown), Jimmy’s trustful hitman, being questioned about the gang’s operation and the cold ways of dealing with snitches. Also, Jimmy’s right-hand, Steve Flemmi (Rory Cochrane) agrees to narrate a few past episodes involving the business. We learn that Jimmy did what he did because he had his back covered by his influential brother, senator Billy Bulger (Benedict Cumberbatch), and a dishonest special agent, John Connolly, earnestly played by Noel Edgerton, who had grown up with them and recently has returned to the city. The latter undermines the police and the FBI and persuades his boss to accept an illicit alliance admitting the ruthless Jimmy as a consultant in the battle against the Mafiosi Angiulo brothers. Step by step, Jimmy, unable to hide his involvement in drugs, extortion, and murder, becomes bigger and more ambitious, imposing total respect to Connolly who becomes shaky when his wife, Marianne, confronts his morality. Unexpectedly, the most significant scenes are non-violent: one in the beginning, when he explains to his little son why he shouldn’t be in trouble for punching another kid at school; and another tense one, when a ‘family recipe’ is easily given away. On the contrary, the violent scenes are scarcely exciting and sum up into a few artful, cold-blooded gunshots. Notwithstanding, and despite the many side characters and situations, the story is no muddled. Depp isn't Brando or Pesci, yet he’s a justifiable fit for the unsentimental role.